Yew Clothing teamed up with Adnams Brewery to put shirts on their running team. They put our specially designed team tops through their paces at the Woodbridge Round the Town Charity 10k Race. Special thanks to Adnams twitter followers for the great slogan suggestion – “Feeling Fantastic Wearing Recyled Plastic – it’s Better in the Long Run“. Do you know someone that might be interested in this email? Why not forward it to them. Greetings from Yew HQ! It’s been a busy weekend all round. Team Yew is nursing blisters and generally recovering from our 60km Walk in aid of the Child Welfare Scheme, a charity that does great things with disadvantaged children and young people in Nepal. 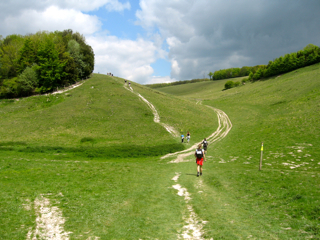 The walk, across the South Downs, was beautiful, and we were lucky enough to do it in stunning weather. The only nasty surprise was that the Downs are a little bit hillier than we were expecting…Maybe they should be renamed the ‘Ups’ instead. If you’re heading out into the sunshine as well then our everywear active tops are perfect for breaking a sweat in. Made from our special lightweight material they are fast wicking and so comfortable you’d never guess they’re made from recycled plastic bottles. As this Sunday is Fathers’ Day, we’re going to run a special offer of 15% off everything online until 25th June. One great suggestion is a Local Warming Jacket. 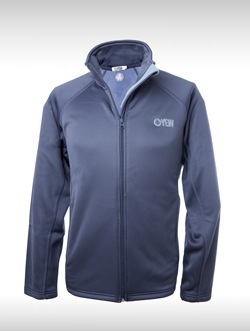 It’s made from 100% recycled fleece, but it’s super soft and warm. Its comfortable and versatile, so would make any Dad happy. Find it here. To make use of this discount, just enter the code DAD at checkout. We were very pleased to provide the official race t-shirt for East Grinstead Triathlon Club’s 25th Anniversary Sprint tri on May 16th. The tops were based on our sustainable Everywhere performance top and were being sold by the club in aid of the Prostate Cancer Charity. Yew also made a donation to the charity. You can see the top designs here. The race itself was great to attend and some of us are thinking about racing it next year. It’s a small but extremely friendly event with a great atmosphere. The atmosphere was improved by so many athletes wearing our tops on race day!